Searching for an inexpensive kitchen scale which is slim, attractive, portable, and easy to store? The Greater Goods Digital Kitchen Scale is a popular and highly rated model with tare function and high precision. 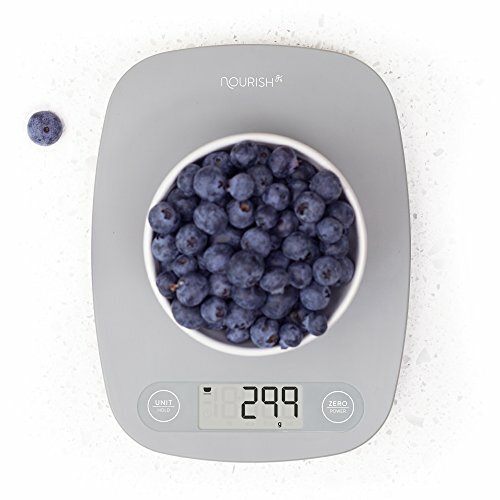 In this review, I will go over the specifications, features, pros, and cons so that you can decide whether this might be the right food scale for your kitchen. Slim, Low-Profile Design: Perhaps the standout feature of this kitchen scale is its build. It is truly beautiful to look at with a minimalist design and a very thin profile. Indeed, many customers remark that it is even slimmer in person than it looks online, and I noticed the same thing with the unit I ordered. It rests flush against your counter, and fits with ease in your cabinet or pantry. Tare Function: With this feature, you are able to reset the scale to zero after you add an empty bowl. That way you can weigh the contents you add to the bowl without the weight of the bowl throwing off your measurement. Auto Off: The scale turns itself off automatically when not in use. You can keep on cooking without having to worry about it. This scale features an amazingly sleek design. I can’t emphasize this enough. While there are a number of beautiful scales out there, this one is as stylish as they come. Cleaning this device is easy, and the surface is scratch-resistant. That means you can maintain your scale in great condition for years to come. The price is right. This is one of the least expensive kitchen scales I have reviewed which still includes all the great features you need. The original battery needs to be replaced almost immediately. A lot of buyers reported this, and I had this issue too—the battery the scale came with was already low on juice when I got it. No major issue—I replaced it, and the new battery is working just fine (the device isn’t draining it too quickly). A few buyers said the scale was inaccurate. I think this must have been a fluke with a few faulty units. The accuracy of my scale was great, and most other buyers also seem happy. You should think about buying this scale if saving space and money are your top priorities. It doesn’t have all the bells and whistles of some more expensive units, but it delivers plenty of great features for a low price. The Greater Goods Digital Kitchen Scale is a powerful low-cost scale which looks great and takes up hardly any space. As a plus, when you buy from Greater Goods, part of your purchase goes to charity. So that’s an added bonus on top of bringing home a great food scale. Help others, save money and space, and accurately weigh your food. It doesn’t get better than that.